Like many others I’ve spent the morning watching the CERN seminar & press-conference on the announcement of the discovery of a Higgs-like boson. 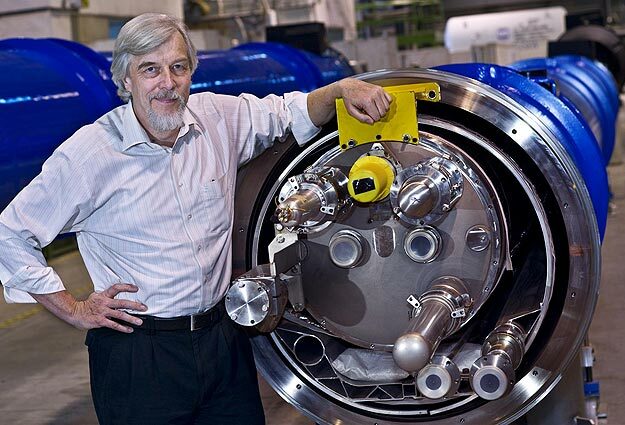 I have nothing to add to the huge amount of coverage of the physics itself, but I do want to note what an excellent job CERN’s director general Rolf Heuer has done in communicating these subtle & difficult issues, with clarity, enthusiasm, and humour. 1. So have they found the Higgs boson or not? Heuer likened the situation to seeing someone from far away. Imagine that you expect your best friend to emerge from over a distant hill at a certain time. Sure enough, a figure appears roughly when and where expected. That is the situation we are in now, following the latest round of data-crunching. But is it really the right person? Or could it be his twin brother? Or someone else altogether? These are the questions for which we need more data. 2. How does the Higgs mechanism give other particles mass? Brilliantly, Heuer compared the Higgs field to a room full of journalists. Massless particles are like unknown members of the public, who can move through the room uninhibited. Massive particles, meanwhile, are celebrities; the more famous they are, the more journalists will gather round them, and the slower they will travel. (He drily observed that Peter Higgs was “very heavy” this morning.) Without these all-important ‘journalists’ to slow them down, other particles would travel at the speed of light. That’s the Higgs field, but what of the boson? Heuer likened this to opening the door to the press room and whispering a rumour. Journalists will come together in clusters, as they try to find out what the buzz is. Those small crowds of journalists are the Higgs particles. 3. Why should we fund CERN rather than developing more practical new technologies? Heuer spoke of a virtuous circle, connecting fundamental science to more applied research, noting that the feats of engineering which allowed this latest discovery required many significant technological breakthroughs. He likened the situation to someone with a sack of corn. Should he eat it all? Or plant it all? In either case, he will starve sooner or later. The answer is he should eat some and plant some; the delicate judgement is in finding the right balance. There have been wild rumours flying around the web about an exciting finding at the Cryogenic Dark Matter Search. Dark matter is a (still!) hypothetical invisible substance, which accounts for the universe behaving as if it is 5 times heavier than can be accounted for by the total visible matter. There are various searches underway for dark particles, but by definition they are hard to see, barely interacting with other particles. However they must have mass, and therefore cannot be completely imperceptible. They have been dubbed WIMPS: weakly interacting massive particles. CDMS works by detecting heat from collisions between particles passing through discs of germanium and silicon, frozen to near absolute zero. Then they have to discount the collisions by particles we already know about. So have they found a WIMP? Or have they just narrowed down the size that any such particle may have? This would be scientifically valuable, but less spectacular. UPDATE: there is 77% chance that they have found WIMPs! The very first catalogue of different types of knots dates from 1876, and was the brainchild of the Scottish physicist Peter Guthrie Tait. In fact, Tait believed he was constructing the periodic table of the elements: together with his friend and fellow physicist William Thomson (later Lord Kelvin), he had developed a theory of physics in which atoms were knotted vortices in an all-pervading aether. According to that hypothesis, to tell chemical elements apart, you had to tell knots apart. The theory of vortex-atoms was short-lived. But Tait’s labour of love, classifying different knots according to their number of crossings, continues to this day. By 1877, Tait had single-handedly got as far as knots with 7 crossings. He was joined in his project by the Reverend Thomas Kirkman, a mathematical vicar from Lancashire in the UK, and Charles Little of the University of Nebraska. Working individually and together, they largely managed to classify knots with 8, 9, and 10 crossings, and made inroads into those with 11. You can read some of their original papers here. Efforts continued throughout the 20th century, aided by mathematical and technological progress. The development of tangle theory by John Conway was one important ingredient. In 1998, Hoste, Thistlethwaite, and Weeks announced a classification up to 16 crossings, amounting to 1,701,936 distinct knots. Although no complete classification is yet known for knots or links (i.e ‘knots’ which involve more than one piece of string) with more than 16 crossings, important subfamilies have been analysed: namely prime, alternating links. Posted in: General Science, Physics. CERN’s Large Hadron Collider is warming up! The most powerful particle accelerator ever built, it promises real breakthoughs in our understanding of our universe. Although modern mathematical physics is amazingly flashy and theoretical, at root it is – of course – an observational science. We observe nature, and then come up with theories to explain what we see. The problem is, as medium-sized animals stuck on a temperate planet, we are severely limited in the types of observation we can make. No matter how clever we are, our theories have to be extrapolated from environments accessible to us to the rest of reality, much of which looks utterly different. There our ideas may stand or fall, but how do we know? That’s why, whenever new technology unveils a side to the world which was previously hidden, it’s an exciting time: from the first microscopes prompting the discovery of cells, to the Hubble telescope zeroing in on the age of the universe. How particles behave at very, very high energies (14 TeV) is something we have not yet been able to see directly. And it’s crucial: these were the conditions at the universe’s birth. This is what the LHC will open up, by whizzing protons round the 27 km loop, smashing them into each other at 300 km/s, and monitoring the fall-out. There are several predictions made by theories of physics which will now be seriously tested for the first time. Particularly tantalizing is the Higgs Boson: a large particle predicted to exist by the Standard Model, but never seen. If found, it wouldn’t just be an important discovery on its own terms, it would be huge evidence for the Standard Model, and so a step towards a Theory of Everything. Jim Pivarski at The Everything Seminar blog is involved as a physicist working on muons. He’s running a series updates on progress. At the moment, they’re testing it out by firing a few protons about, and the first proper collisions are rumoured to be scheduled for October. So, watch that space. Meanwhile, here are some awesome pictures of the awesome machine.